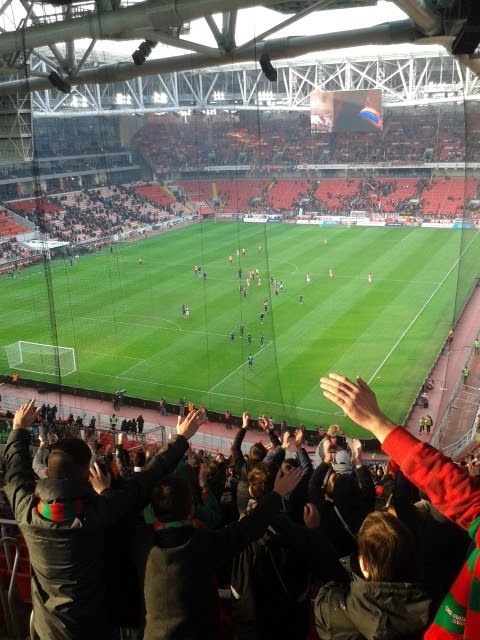 Lokomotiv put a massive exclamation point on their recent spectacular form by earning their first win ever at Otkrytie Arena over Spartak by a score of 2-1. Not only was it a Moscow derby day but it was also a battle of Russia's 2nd and 4th placed teams plus a face-off of two home-grown boys, Chevevchenko and Alenichev, appointed this season to lead turnarounds for their beloved clubs. Loko was able to use Cherevchenko's preferred eleven as we were free of notable injuries or suspensions. Spartak was without the Cape Verdean sensation Ze Luis and Promes didn't start despite having recovered from injury. An interesting formation change saw the 'Myaso' use five defenders to try and slow down Loko's attack. On this gloomy, overcast day 38,000 Muscovites made their way to the stadium, which will most likely be the largest crowd to watch Loko in Russia this year. 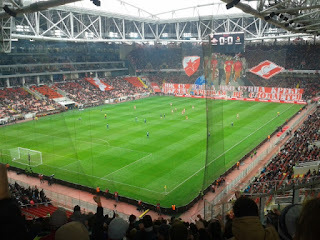 Only the upper portion of the normal, corner fan sector at Otkrytie Arena was occupied by us showing again our inability to get fans to any stadium. Those who didn't come missed quite a show. It was only the 9th minute when Denisov saved a ball going out-of-bounds and crossed to the far post. Samedov rescued that ball from going out of play with his head and put it in front of the goal where Kolomeytsev flew in with a diving header to make it 1-0 for the Railwaymen. Minutes later, Pejcinovic could have doubled the score with a header of his own, but the ball agonizingly hit the crossbar. Tarasov was subbed off due to injury with Miranchuk brought on, noticeably weakening the midfield with Kolomeytsev moving back into Tarasov's spot, and Spartak slowly worked their way back into the game with some neat combination play in the penalty box, but the final pass or shot was always snuffed out by the Loko defense. At halftime, Promes replaced Zotov for Spartak and almost made an instant impact with a powerful shot, but moments later a touch of brilliance from Niasse tilted the balance squarely in Loko's favor. Denisov played him the ball at the top of the box. He made a nice move right, then his attempt at a pass caromed off Shirokov back into his path for him to launch a one-time strike just out of the reach of Rebrov into the upper right corner for a commanding 2-0 lead. That's went the match took a turn for the worst. Not for the players though, but for the fans. Fans of the 'Myaso' had always taken exception to the colorful, unfit-to-print chants of the Loko fans, but being down two goals pushed them over the edge. Flares lit up at both ends of the stadium and smoke drifted over the field. This type of scene is pretty typical at a Spartak match, but then a rocket whizzed in front of my face. 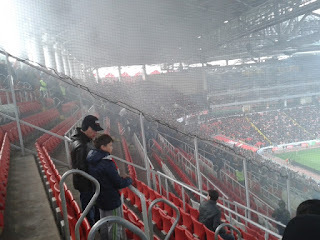 The Spartak fans were shooting fireworks at us. Security rushed over to try to calm things down just before they reached the tipping point. 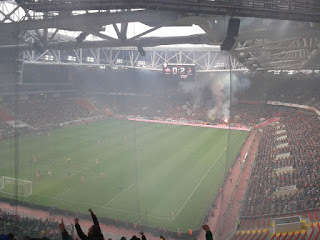 As far as I know, no Loko fans were injured by this pyrotechnical onslaught. An injury to Pejcinovic brought on Mykhalyk, not Djurica, which made it clear that our Slovak man isn't quite ready yet. 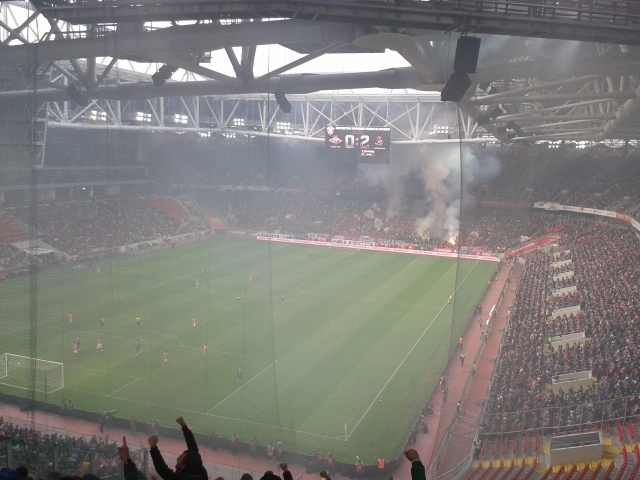 At about this point, Spartak seemed to find their footing and began their assault on our goal. Bocchetti gave Spartak a lifeline with a goal in the 74th that he squeezed through from a cross at the near post. From there, Spartak camped out in our half for most of the remainder of the match, but the defense held strong with Guilherme grabbing an important diving catch from an acrobatic shot by Popov. Niasse, the one man counter-attack, wasted away many of the last moments with long, defense-eluding runs, but disappointing finishing prevented him from putting the match beyond reach. Nevertheless, the red and green were able to see out the four minutes of stoppage time and picked up an impressive and emotional derby win!